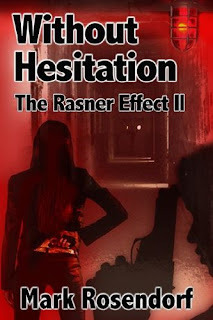 The Rasner Effect was a great read and I'm looking forward to Without Hesitation. I love thrillers! I would be too mad if I was in the witness protection program and had lousy jobs like that! I, too, questioned Mark's sanity in The Rasner Effect. I have the sequel and hope to get into it this week. Cute site, by the way. I prefer thrillers with romance. So does the series have some romance there? Definitely no romance in this one. It's pretty gritty. A job cleaning up after frat boys? Are you sure this isn't a horror book?